Cooking, nutrition, health and gardening were all of great interest to Georgia O’Keeffe. Her book collections contain numerous titles on these subjects. 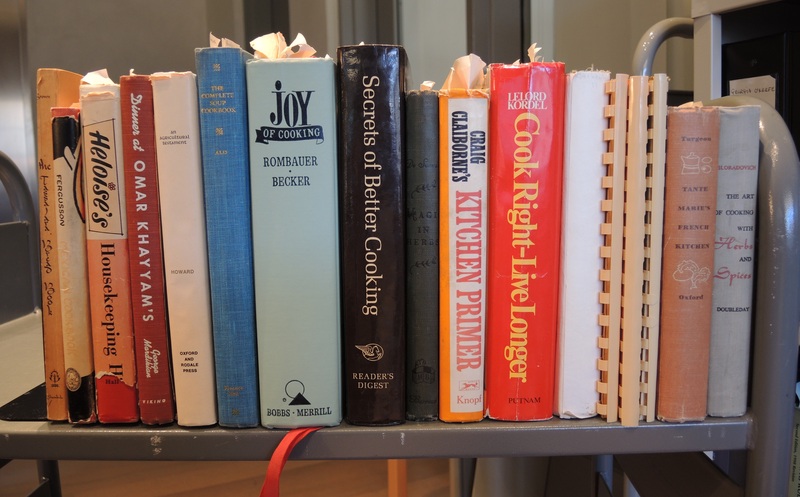 There is a small selection of books in the Abiquiu kitchen that illuminate O’Keeffe’s range of food interests. The kitchen is our first stop in our endeavor to catalog the books from the Abiquiu home. Kitchen books in the RC ready for processing. These books demonstrate years of use with annotations, page markers and ephemera throughout. The book that showed the most use was Lelord Kordel’s Cook Right – Live Longer. The repaired binding, numerous pieces of ephemera, over 15 page makers, and several handwritten annotations demonstrate regular use. Although we know that O’Keeffe’s books moved between her two homes, it is clear that Cook Right, Live Longer by Lelord Kordel was kept in both houses, and both were used often. There are a few recipes in Cook Right – Live Longer that are bookmarked, annotated, and noted in other places. Who is ready for a potluck of O’Keeffe’s favorite recipes?